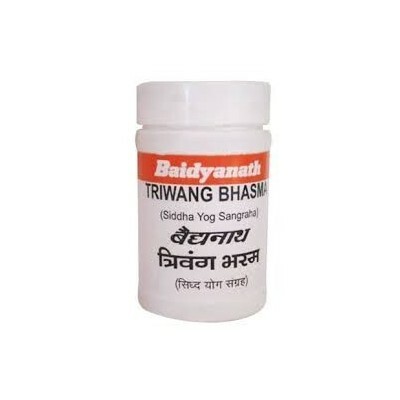 Baidyanath TRIVANGA BHASMA is Useful in Urinary Track Infection, Diabetes, Impotency and Leucorrhoea. The most common use of Trivang bhasma includes impotency and nocturnal emission. Here we discuss some its important uses and benefits. Trivanga bhasma reduces frequency of Nocturnal Emission (wet dreams). It is used with Amla Murabba and Isabgol (Psyllium Husk) in such case. Trivang bhasma has aphrodisiac action, which helps sustaining erections and providing strength to penile tissue. It should be used with cow’s ghee and milk for treating erectile dysfunction. Additionally, Ashwagandha, Kaunch Pak, Musli Pak etc. should also be used. Female infertility can also be due to incapable endometrium to implant the fertilized eggs or underdevelopment of uterus and ovaries. In such cases, Trivang bhasma along with Ashwagandha Churna and milk works well. It strengthens the uterus and makes it capable for implantation. It also induces ovulation and beneficial for women with Anovulation. In this case, it should be used along with Phalasarpis. The most common cause of Recurrent Miscarriages is weakness of the uterus. In such case, Trivang bhasma along with Ashwagandha Churna, Misri (crystalline sugar) and milk is beneficial. It should be used for 6 weeks initially and then Ashwagandha Churna should be used with Misri (crystalline sugar) and milk for next 3 months. During this period, women should avoid physical relations and should not try to conceive. Trivang Bhasma contains heavy metals, which are processed with herbs and heated under high temperature. Safety of Trivanga Bhasma is not well-established. It should only be used for a short-period (less than 6 weeks). The long-term use of Trivang is not advisable. According to study published in AYU (An International Quarterly Journal of Research in Ayurveda), Trivang Bhasma was likely safe. There were no significant alterations found histopathologically and hematologically. Clinically, no abnormal signs were found. No side effect appears when Trivang Bhasma used for a short period i.e. less than 6 weeks. The long-term use may cause heavy metal toxicity of lead. Trivang Bhasma should not be used in Renal Failure (chronic kidney failure).